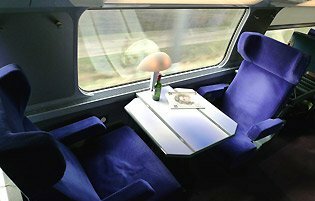 Relax with a glass of red at a 1st class upper deck table for 2 on a TGV Duplex from Paris to Barcelona. Speed along the Rhone Valley at 186mph past pretty French villages, watch for the flamingos on the étangs (lakes) in the South of France with glimpses of the Mediterranean. Skirt the Pyrenees to arrive in central Barcelona, 6h25 from Paris. Flying takes 4-5 disjointed hours with 10 times the CO2 emissions. Double-deck TGV Duplex high-speed trains now link Paris Gare de Lyon to Figueres, Girona & Barcelona at up to 200mph. Paris to Barcelona takes a leisurely 6h25 city centre to city centre for the 1,073km (667 miles), compared to a tedious 5 hours by air once ground transportation, check-in time and airport security are included. 2 trains per day run all year round, increasing to 4 trains a day in summer. Forget flying, chill out with a glass or two of red wine and enjoy the ride along the scenic Rhone Valley, watch for the flocks of flamingos on the étangs (lakes) in the south of France, and glimpse the coast and the Pyrenees before arriving in the centre of Barcelona. Watch the video guide. 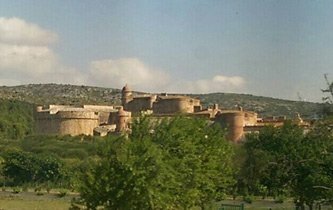 Travel tips - definitely read these! Read downwards, each column is a train you can take. You can check train times for your date of travel at www.loco2.com. * = This train runs daily from 1 June to 1 September 2019. ** = This train runs daily from 29 June to 1 September 2019. *** = This train runs daily from 30 June to 2 September 2019. Paris to Barcelona is 1,073km (667 miles). These TGVs average around 105 mph including stops. Paris Gare de Lyon: See station information & map. 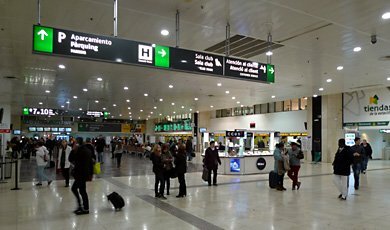 Barcelona Sants station: See station information & map. Figueres Vilafant station is 5 kilometres from Figueres city centre, taxis are available. Free if not occupying its own seat. InterRail & Eurail passholders pay £23 (€26) 2nd class, £30 (€33) 1st class. Small dog less than 10Kg in a pet carrier £53 each way. Guide dogs free. Cheap fares = Prems or Leisure fares = Book in advance, price varies like air fares, limited or no refunds or changes. Full-price = Refundable and flexible. There are no senior or youth reductions. Child fare = Child 4-11 years, use an adult special fare if cheaper, as it often is. Children under 4 free. Which website should you use to buy tickets? You can buy Paris-Barcelona TGV tickets online up to 120 days in advance at the following websites, they all charge the same basic prices but some add a booking fee, some don't and some sites offer seating options, some allocate your seat. They all issue print-at-home or collect-at-station tickets. (1) www.loco2.com - Recommended, easy to use & no booking fee. You can use it wherever you live, overseas credit cards accepted, no booking fee, prices in €, £ or $, you print your own ticket. It shows your seat numbers before you pay, any seat number greater than 60 is upper deck - if you get a seat number less than 60, add it to your basket and re-run the enquiry until you get one >60. Then delete the seats/tickets you don't want. Loco2 also connects to the Renfe (Spanish Railways) ticketing system, so any journeys from Paris beyond Barcelona to Madrid, Alicante, Seville, Malaga etc are best booked using Loco2. (2) www.trainline.eu - now charges a booking fee for tickets sourced from Renfe's system. You can use it wherever you live, overseas credit cards accepted, but it now adds a small booking fee to tickets it sources from the Spanish ticketing system. Prices in € or various currencies. See the video tutorial. It also shows your seat numbers before you confirm and pay, any seat number greater than 60 is upper deck, so you can keep adding to basket until you get a seat number you like. Also connects to the Spanish Renfe ticketing system, so can also do tickets beyond Barcelona. (3) www.raileurope.com & www.raileurope.ca for residents of the USA or Canada, booking fee charged, seats allocated with no choice. (4) www.raileurope.com.au if you're in Australia, small booking fee charged, seat allocated with no choice. Can't sell iDTGV trains or Forfait. (5) www.raileurope-world.com	for residents of Canada, Australasia, Asia, Africa, South America, small booking fee, seats allocated with no choice. To buy tickets by phone in the UK, call International Rail on 0844 248 248 3, lines open 09:00-17:00 Monday-Friday. When do bookings open? Bookings for this route should usually open 120 days before departure (extended from 92 days in 2014), although bookings for dates immediately after the timetable changes in mid-June & mid-December often open late, perhaps as little as 60 days ahead. In addition, they haven't always maintained the 92/120 days with these trains. I have also seen bookings open further ahead on the Spanish system (used by www.loco2.com to book these trains) than on the French system (used by the other sites mentioned below) so try both! 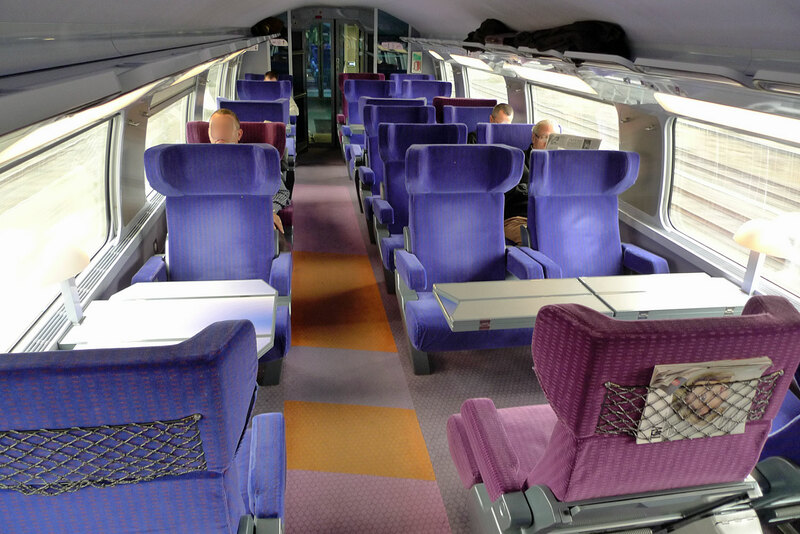 Click here for TGV Duplex seat numbering plans. Seat numbers 11-58 = lower deck, seats 61-128 = upper deck. Car 1 (= car 11 in the second TGV unit on a 2-unit train) is usually at the Paris end of the train, although this can't be 100% guaranteed as the unit could enter service either way round. Coming from London, Brussels, Cologne or Amsterdam? 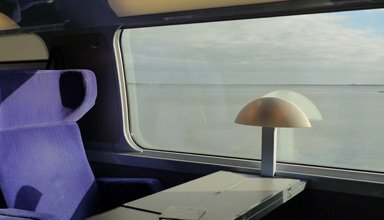 You can buy connecting Eurostar tickets between London & Paris at www.eurostar.com. Connecting Thalys tickets between Amsterdam, Cologne, Brussels & Paris can be bought at www.b-europe.com. How to buy onward train tickets within Spain: Onward trains from Barcelona to Madrid, Valencia, Alicante, Granada, Seville & Malaga can be booked at the Spanish Railways website www.renfe.com or if you have any payment problems, www.loco2.com (in €, £ or $) or instead, as they have a link to Renfe's system, same prices and same print-at-home tickets. Red = high-speed lines. Green = scenic sections of line. Black = conventional lines. Highlighted = Paris-Barcelona TGV route. 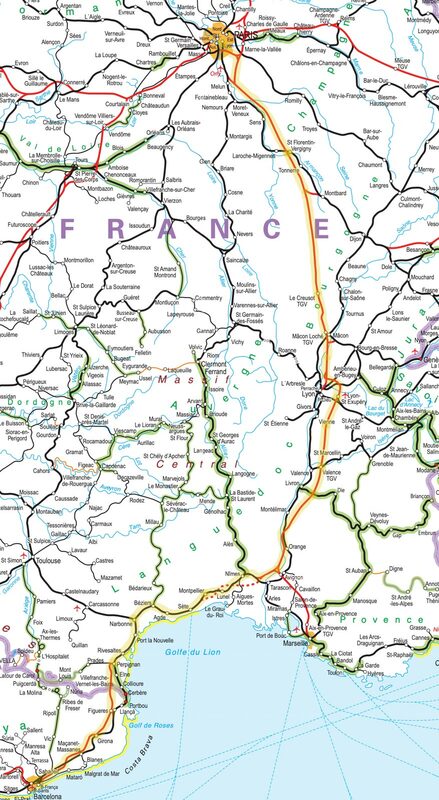 Reproduced from the excellent European Rail Map with kind permission of the European Rail Timetable people. I recommend buying the European Rail Map and a copy of the European Rail Timetable, they ship worldwide, www.europeanrailtimetable.eu. The Paris to Barcelona trains are impressive TGV Duplex double-decker high-speed trains. 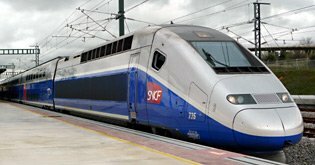 They operate at up to 186mph (300km/h) on the Sud-Est high-speed line between Paris and Nimes, and up to 199mph (320km/h) on the new high-speed line between Perpignan and Barcelona. You board the train at the lower level through a wide sliding external door into a small entrance area at one end of the lower deck. Here, there's a toilet and the door into the lower deck seating area. A wide, short & easy flight of just 9 stairs leads from the entrance area to a landing at one end of the upper deck, with an upstairs toilet and a door to the upstairs seating area. You walk along the train from car to car at the upper level. There are luggage racks both upstairs and downstairs, at the coach ends and between the seats. 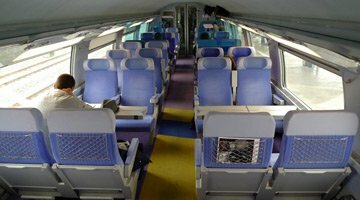 See seat numbering plan for the Paris-Barcelona TGV Duplex. 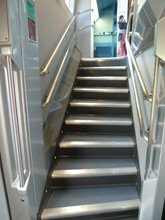 If you have significant problems with stairs or very heavy luggage, the lower deck might be best. But for the best views (over the top of the occasional sound barrier along the high speed lines! ), definitely choose an upper deck seat, the stairs are easy and there are toilets & luggage space upstairs. For couples in first class, an upper deck club duo face-to-face table-for-two is easily the best option if you can get it. 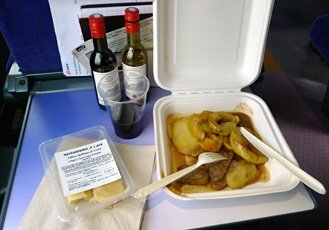 There's a cafe-bar serving drinks, snacks & light meals broadly similar to this sample menu from another French TGV, or you're free to bring your own food & wine along for the journey. 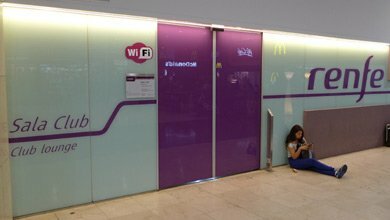 There are power sockets for laptops and mobiles at every seat and there are baby-changing facilities and designated spaces for passengers in wheelchairs. SNCF equipped these international TGVs with free WiFi in January 2019, so you should find WiFi available with the network appearing as Le WiFi. If you have a 3G or 4G mobile data package, that will work fine along the majority of this route. Cafe-bar on upper deck in car 4 (or 14), serving tea, coffee, soft drinks, wine, beer, snacks & microwave-style hot dishes. 2nd class seats, on upper deck with a mix of tables for 4 & unidirectional seating. 360º photo..
1st class seats on upper deck, club duo on the left, club quatre on the right. 360º photo. The stairs to the upper deck. Just 9 steps, wide, shallow with double handrails. No problem! 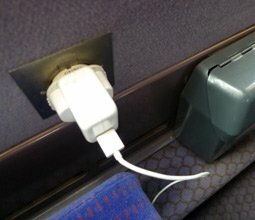 Power sockets: All seats in both classes have power sockets, 2-pin 230v. Your train may have WiFi, whilst in France. Luggage racks. You take your bags on board with you and place them on the racks. There are racks both upstairs and downstairs, both at the car ends and (as here) between the seats. 1. Paris Gare de Lyon. The train to Barcelona leaves from the magnificent Gare de Lyon in central Paris, a landmark in its own right. See Gare de Lyon information page. Hall 1 at the Gare de Lyon. The TGV may leave from Hall 1 or Hall 2, see the Paris Gare de Lyon station page. 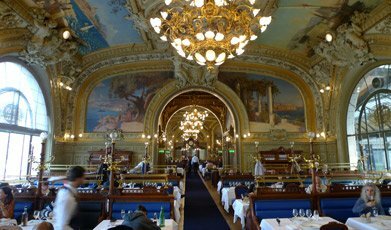 How about lunch at the amazing Train Bleu restaurant in Hall 1 of the Gare de Lyon before catching the Barcelona Express? Or just have a coffee or beer in the bar (above right), which makes an excellent VIP waiting lounge. ...On a clear day you can see the snow-capped French Alps in the extreme distance to the left, and the dark line of the Massif central mountains on the far side of the valley to the right. 4. The Rhone & Chateau de Montfaucon... Between Valence and Nîmes the train crosses a broad stretch of the River Rhone with a view of the wine-producing Chateau de Montfaucon on the right, www.chateaumontfaucon.com. 5. 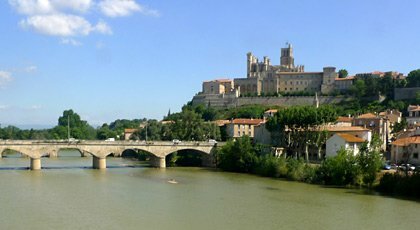 Béziers... The train calls at Nimes and Montpelier, then passes non-stop through Béziers station. As the train crosses the River Orb just west of the station, look right for a great view of Béziers' 13th century cathedral (yes, the photo above right was taken from the train, these all were!). Above left, lunch from the cafe-bar, a magret de canard avec pommes de terre and some red wine from the cafe-bar. By all means bring your own picnic and bottle of wine! 7. Vineyards. The train passes countless vineyards. Glass o' red from the bar car, anyone? 8. Étangs & flamingos... The train passes numerous étangs (lakes), where flocks of flamingos stand one-legged in the shallows. 9. The Fort de Salses... Just before Perpignan, the train passes by the impressive Fort de Salses on the right, a 15th-century Catalan fortress captured in 1642 and French-held ever since, see en.wikipedia.org/wiki/Fort_de_Salses. 10. Mt Canigou & the Pyrenees... One of the highest peaks in the mighty Pyrenees, the 2,784m (9,137 feet) high Mt Canigou dominates the skyline on the right all the way from Perpignan to Girona, see en.wikipedia.org/wiki/Canigou. 11. Barcelona Sants station... A modern station in central Barcelona, with plenty of taxis, and a metro to all parts of Barcelona. 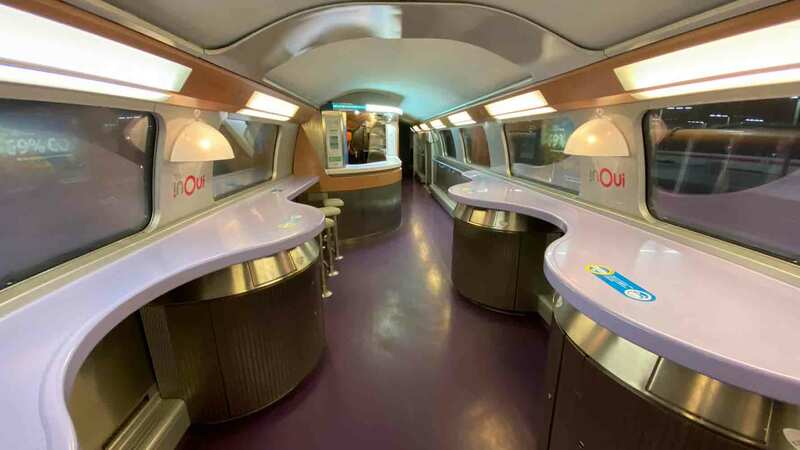 There are left luggage lockers (consigna) and a Sala Club 1st class lounge which you can use if you have a 1st class ticket for the TGV for up to 2 hours before it departs, although not on arrival. More information about Barcelona Sants station. X-ray check when boarding: At Spanish stations including Barcelona Sants, there's a quick X-ray check of all baggage before you can go onto the high-speed platforms, which includes boarding a northbound TGV to France. There are usually no metal detectors, so you can carry what you like on your person, it's only your baggage that's checked. Make sure that any (perfectly legal) penknives, corkscrews etc are in your pockets not your baggage so don't get scanned, to avoid a jobsworth refusing to allow them on, as happened to one passenger. There is no such check at any French station, where there is free & easy access to the train. 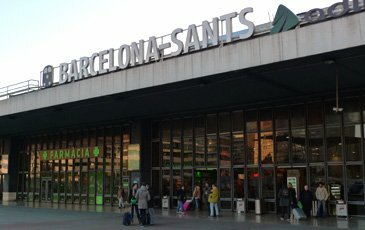 More information about Barcelona Sants station. 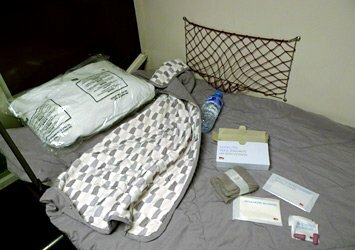 Should you go 1st or 2nd class? 2nd class is perfectly comfortable so there's no need to pay for 1st class unless you really want to and can afford it. There is no food or drink included in the 1st class fare, it's just the extra space and legroom that you're paying for, plus use of the first class lounge on departures from Barcelona. On the other hand, first class seats are arranged 2+1 across the car width, so there are individual 'solo' seats and tables-for-two in 1st class as well as the dual-side-by-side and tables-for-four which you'll also find in 2nd class where seats are arranged 2+2 across the car width. Prices vary in both classes, so sometimes 1st class is little more (and can even cost the same or less) than 2nd class, so see what prices you get for each class before you decide. Upper deck seats are the best! 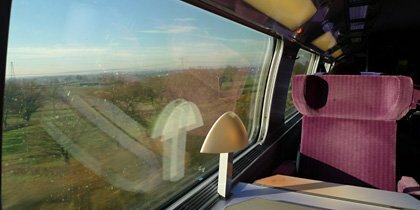 Whichever class you choose, I recommend an upstairs seat on the TGV Duplex for the best views of the scenery. It's only 9 wide and easy stairs up from the entrance and once upstairs you can walk along the train to the cafe-bar, there are toilets & luggage space. Unfortunately, thanks to Renfe-SNCF's choice of booking system, you won't be offered any seating options, but here's the workaround: www.loco2.com & www.trainline.eu both show seat numbers before you pay, and any seat number above 60 is upper deck, less than 60 is lower deck. If you get seat numbers less than 60, leave it in your basket and re-run the enquiry to see if you get a seat number greater than 60. Repeat this until you get upper deck seats. It once took me 8 attempts, but I got my upper deck seat! See the TGV Duplex seat numbering plan, these are EuroDuplex trains. 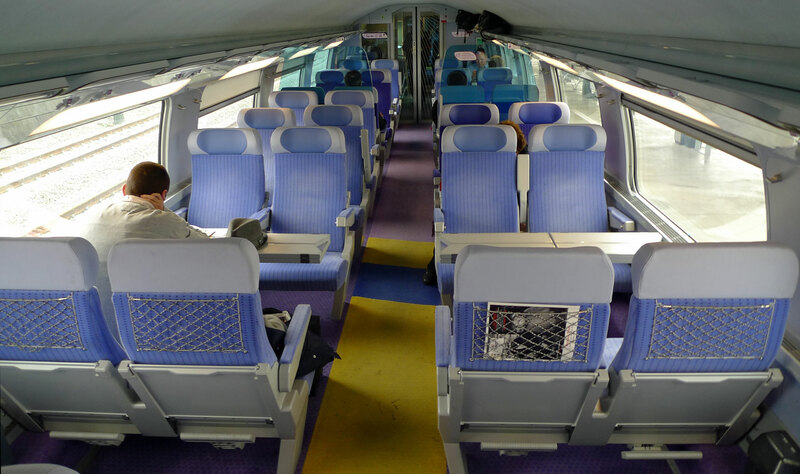 You cannot select forward-facing seats, but car 1 (or in the second TGV unit, car 11) is usually at the Paris end of the train and you can work out which way seats face from the TGV Duplex seat numbering plan. These trains usually leave Paris as two TGV Duplex units coupled together. Cars 1-8 at the rear are uncoupled at Perpignan, cars 11-18 up front continue to Barcelona. I highly recommend using the bar or having a meal at the celebrated Train Bleu restaurant inside the Gare de Lyon (Hall 1). Opened in 1903, it's a listed national monument, and an experience in itself. 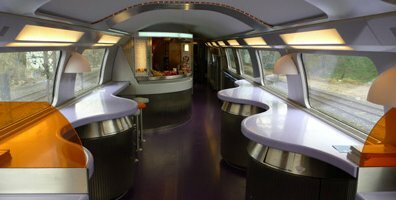 You can reserve a table for lunch or dinner online at www.le-train-bleu.com. 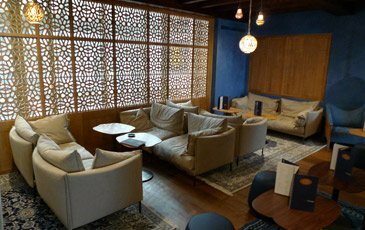 When leaving Barcelona with a 1st class TGV ticket to France, you can use the Sala Club first class lounge at Barcelona Sants station for up to 2 hours before your departure. This has complimentary snacks, tea, coffee, soft drinks and beer. However, there's no access to any departure lounge in Paris, so my advice is to use the Big Ben Bar inside the Train Bleu restaurant as your VIP lounge, for the price of a coffee or beer. See a short illustrated guide to Paris Gare de Lyon. There's easy level access to the train in Paris, you can just wander from the street or the metro or taxi rank into the station, glance up at the departure boards to check the platform number, walk onto the platform, press the door open button and board the train any time up to when they close the doors, a minute or two before departure. The actual platform number may not be posted until 20 minutes before departure, but the departure boards at the Gare de Lyon will tell you whether it will leave from Hall 1 (blue, platforms A to N) or Hall 2 (yellow, platforms 5-23) so you can wait on the right concourse close to where the train will leave. The more historic concourse with platforms A to N and the famous Train Bleu Restaurant is Hall 1, the newer concourse accessed along platform A or through the ticket hall is Hall 2. In Spanish stations there's a very quick (2 minute) X-ray baggage scan when entering the departures area, that's what the Spanish do for all their high-speed trains. 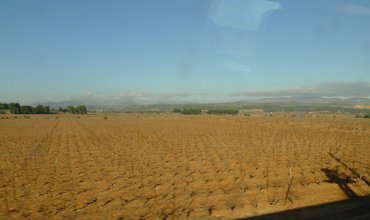 So don't cut it too fine when starting your journey in Spain. See a short illustrated guide to Barcelona Sants. Luggage works exactly as it does on any other European train. To us Europeans, it's obvious, but overseas visitors worry obsessively about luggage so I'll spell it out. For all practical purposes you can take what you want onto the train, nobody will weigh it or measure it unless it's truly unreasonable, your bags aren't checked in or anything, you simply take your bags on board the train with you and stick them on the racks above your seat or between the seats or at the car ends. There are racks both upstairs & downstairs, and the stairs to the upper deck are shallow and wide enough to make taking bags upper deck pretty easy. I always find a rack right near my seat, so I can easily see my bags from my seat and access them when needed. It's as simple as that... No luggage worries! Bikes are carried on these TGVs free of charge as ordinary luggage if they are semi-dismantled and placed in a zip-up bike bag not exceeding 120cm x 90cm. See the Taking bikes on trains page. Taking dogs & pets: See the Taking dogs on trains page. Figueres is worth a stop for the amazing Salvador Dali museum, and Dali's home at Port Lligat is just a bus or taxi ride away on the coast, also well worth visiting. 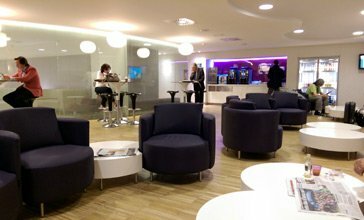 The Sala Club lounge at Barcelona Sants, with complimentary coffee, soft drinks, beer & snacks. It can be used by anyone with a first class TGV or AVE ticket, although not by railpass holders. 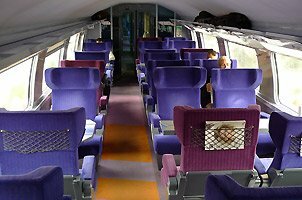 The overnight Elipsos trainhotels between Paris & Barcelona, and Paris & Madrid, were sadly discontinued in December 2013. 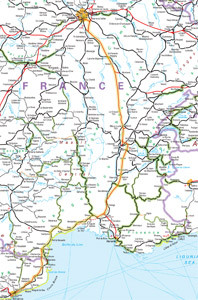 However, it's still possible to travel overnight between Paris and Barcelona in either direction, using a French Intercité de Nuit couchette train between Paris and Latour de Carol, with a connecting local train to or from Barcelona. Spending the night on an overnight train only saves a couple of hours over taking a morning TGV, as the 07:15 TGV from Paris arrives in Barcelona around 13:30, the overnight option arrives around 11:30. But it saves a hotel bill and makes an interesting contrast to the TGV journey - and it can also be cheaper if you can't find any cheap fares for the TGV! 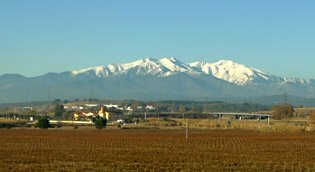 The route via Latour de Carol crosses the Pyrenees and is very scenic indeed, both for the last hour of the sleeper journey south to Latour (at least in summer, when it's light) and between Latour and Barcelona. 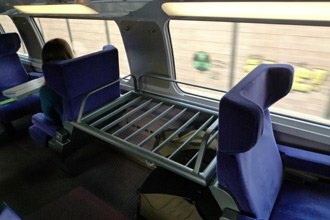 Step 1, use the overnight Intercité de Nuit couchette train between Paris Austerlitz & Latour de Carol, deep in the Pyrenees. Book this online at www.loco2.com. Step 2, then use a Spanish local train between Latour de Carol and Barcelona Sants, no reservation necessary or possible, simply buy this ticket on board the train from the conductor for around €12. Northbound, you leave Barcelona Sants around 15:00 and arrive Paris around 07:30. You'll find exact times in either direction in this section on the London to Spain page. If you have any trouble booking the Paris-Barcelona TGV, or if prices on that route are sky-high, this might be a useful alternative! ...close to Barcelona Sants station, for an overnight stop. If you're only stopping in Barcelona briefly between trains, a hotel close to Barcelona Sants station might be best. Here are some near the station with good or great reviews: Hotel Barcelo Sants (4-star, situated directly above Barcelona Sants station itself, around £79-£120 per night), Gran Hotel Torre Catalunya (4-star, around £95-£110, across the road from the station), Hotel Just Style (around £105), AC Hotel Sants by Marriott (4-star from around £85, located just 50m from the station), Hotel Catalonia Roma (3-star from around £79), Hostal Baler (2-star from around £58), Hotel Transit (1-star from around £58 per night). For something special... There's the famous & flashy Paris Ritz in the Place Vendôme of course (over €500 a night) or the similarly-priced Le Meurice, but if you want a really special hotel for a luxury break or romantic weekend and can afford to splurge around €290 a night, I'd recommend the small, sumptuous and intimate L'Hotel. It's on the bohemian left bank, walking distance from the Seine, the Ile de la Cité & Notre Dame. Oscar Wilde spent the last days of his life here in room 16, and the hotel has been used by many famous people from Sinatra to Mick Jagger. Rooms are on the cosy side, but they are beautifully decorated and have character that other hotels lack.